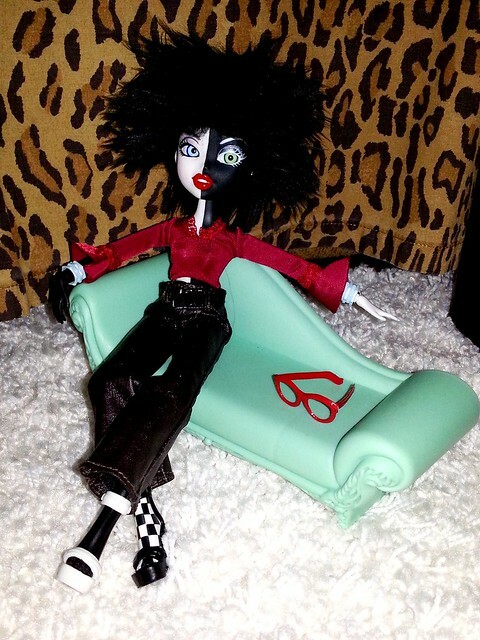 what are your favorite doll clothing swaps? Re: what are your favorite doll clothing swaps? 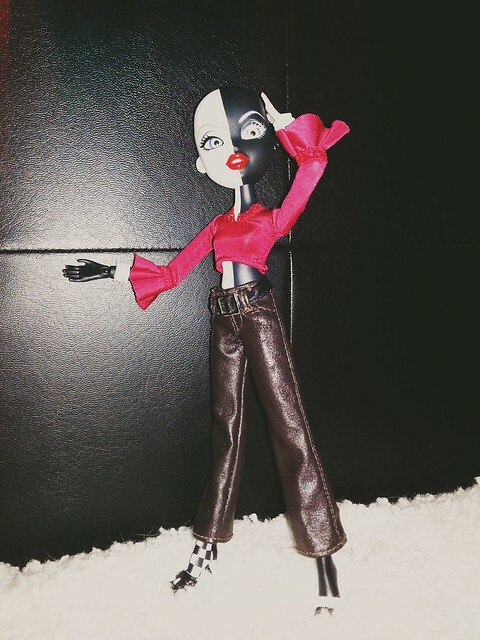 Are Bratz/Bratzillaz clothing swaps OK to post here? I see no reason why not! I see a Pullip on the last page - and I think I posted a mini Blythe wearing a Novi Star dress around here somewhere. So go for it! dfotw, is your Catrine head on a Spectra body perchance? Indeed! It was my first 'serious' mod, giving a Spectra body a tail so I could have my Catrine Cheshire. Good eye! I was SO excited to see her, what with all the Skelekitties I'd been pondering a Ghostikitty! If you don't mind, which Spectra & Catrine did you use? She's SPOOKtacular! And I LOVE that she's a Cheshire kitty!!! Thank you! And yes, moar Ghostkitties! I used Ghouls Getaway Spectra and Gloom and Bloom Catrine, but I think those two are generally a good match in all incarnations. Good luck with yours! Any tips for adding her tail? I have a Spectra who is also becoming a ghost kitty (just waiting on the head to arrive...) and I was trying to figure out the best method for doing it. So far, I'd considered adding a belt like the one on Freaky Fusion inspired Scarah, and hiding it under a poofy dress. I drilled a hole in the back of the Spectra body, about the same height as the hole is in the Catrine body. I don't have power tools, so I used pointy screws and a bit of elbow grease until I got the width necessary to hold the Catrine tail in place. I was nervous about screwing it up, but it was pretty easy! Let me know if you need pics. Noooo to the power tools on my part. I'd be too worried about drilling a hole straight through by mistake. I have a hand-powered craft drill I might give a go, or else just follow your example and gently dig in with a screw. Lhia, in googling about the sanding needles I came across something called a 'pin vice' - used for drilling into small scale stuff like miniatures. Might be what's needed for drilling tail holes? Any details beyond that? Pin vices are what those super basic reroot tools are. A "pin vice drill" has a little flat bit on back that you set against your hand, which spins without unthreading. The craft drill I have uses one attached to a handle for grip. Aaaaaand, we're back to doll clothing swaps! Here are two I really like - Bratzillaz Switch-a-Witches, wearing Bratz clothes but mostly boyz ones! I think the jeans, 'leather' pants, and the orangey shirt are Bratz boyz. Pink/blue wig is Switch-a-Witch. Green flower some random flower barrette I found. Red crop top, I think Bratz, from some ebay lot. The black wig is a faux fur handmade one. 'Scuse the flash, I know some don't like it, but these were taken last year before I joined MHArena. I kinda like the blown out effect myself, in moderation. And with the standing doll, I purposely positioned the flash halo around her hand. jinafire looks great in luna's black body suit & neck piece thing! but then again there's not much plain black clothing DOESN'T go with.. will update post with some pictures when I take some! I don't have any pics, but I do have a request. 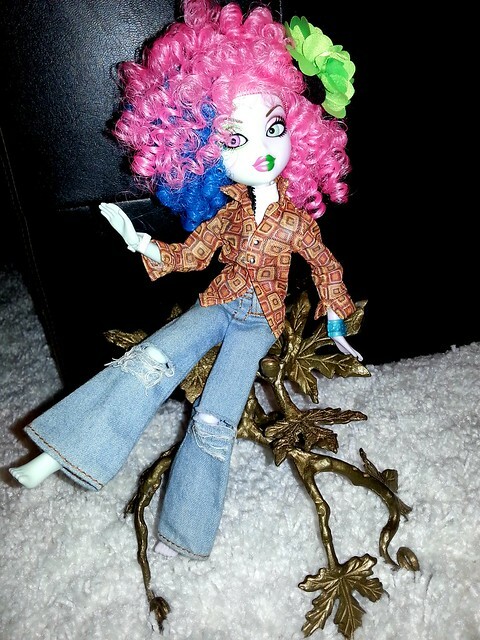 Does anyone have River Styxx & Ari Hauntington Dessert Ghouls doll? I'd like to see Ari's dress & headpiece on River, seeing as she's a candy-loving party ghoul. My Wishlist - Seeking US store exclusives & Frankie merch! Put the dress from my Party Ghouls Abbey doll. I think it's an adorable look for her. What do you think? Uber-cuteness! That's a great outfit anyway, and the darker outfit really lets Apple's hair shine!